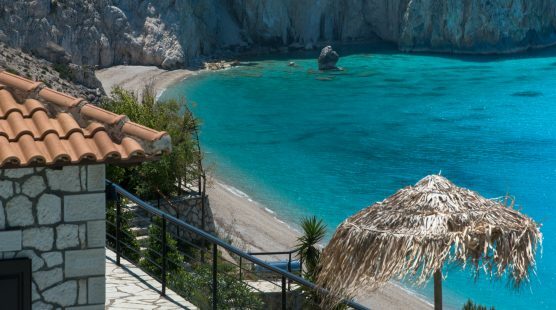 There are four Traditional Stone built villas in a small quiet complex, divided onto 2 levels for ultimate privacy and space. 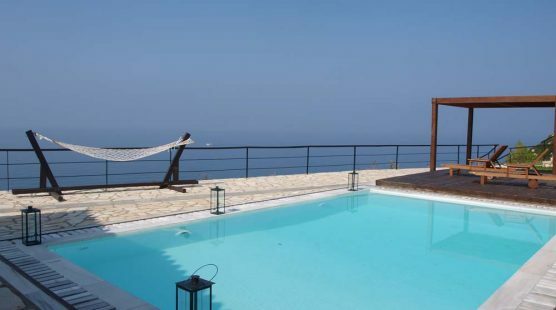 On the upper level there are two villas, they have two double bedrooms and a further twin bedroom on a mezzanine level above the living area. 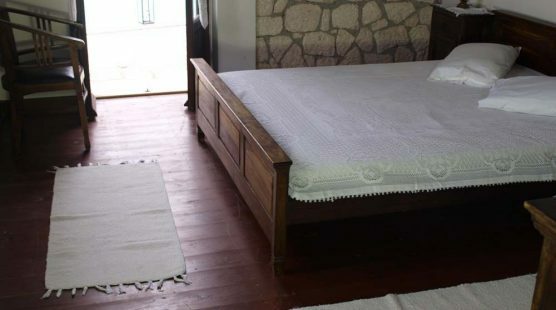 They also have two bathrooms and can accomodate six people. 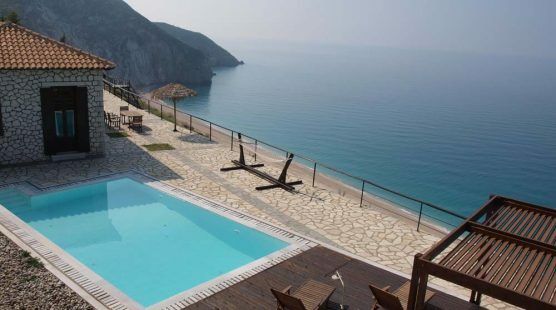 These villas have their own private pools. 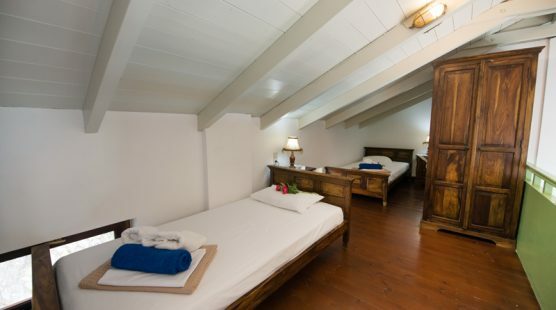 On the lower level there are also two villas. 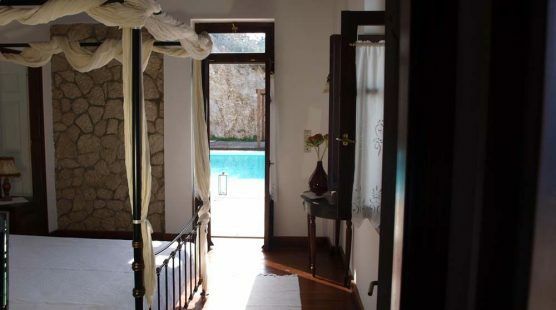 A smaller one which can accommodate 4 people in two bedrooms and has its own private pool and a larger one which can accommodate 6 people in 3 bedrooms and has an outdoor Jacuzzi for six people. 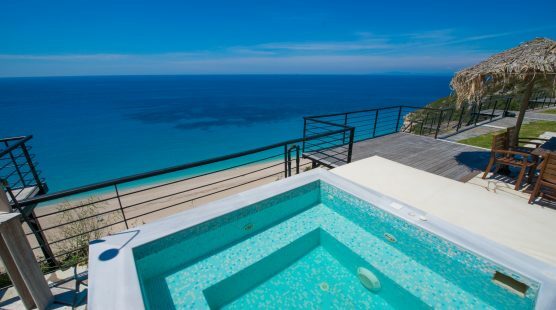 All pools and Jacuzzi are superbly designed and overlook the majestic blues of the Mediterranean. 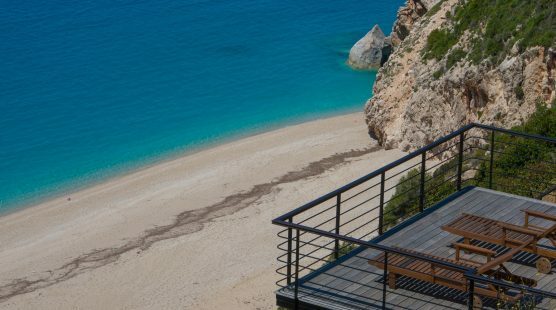 All the villas have been built to a very high specification, offering the utmost in comfort and style. Features include dark wood floors, ceilings and windows and have matching furniture. 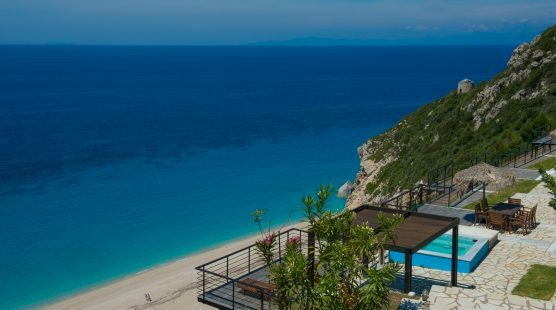 The views from the villas over the crystal blue waters are second to none and the sunsets are absolutely breathtaking . 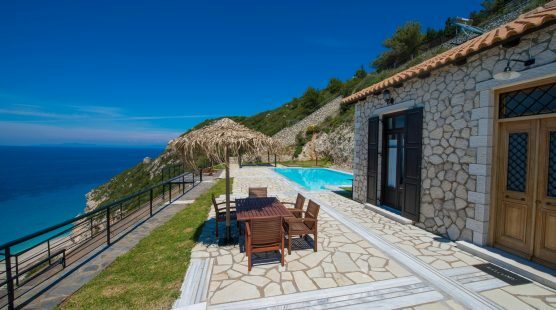 The villas compliment an open plan living, dining, kitchen area with full cooking facilities, fitted oven, fridge freezer, dishwasher, coffee machine, kettle and kitchen utensils. Also included is a washing machine, satellite TV and full reverse cycle air conditioning. 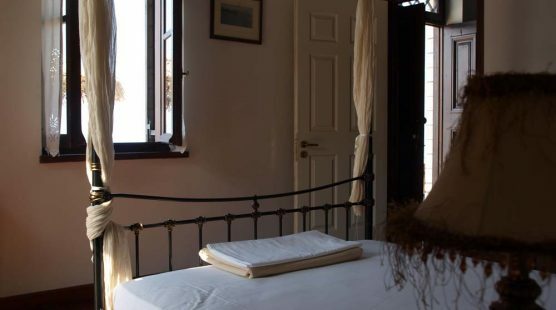 The two bedrooms have four poster beds, one with ensuite shower room and a large bathroom which is approached from the lounge area. 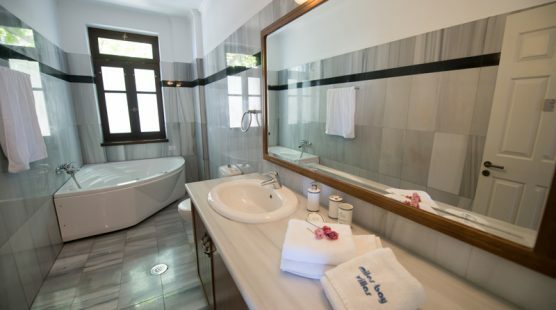 The villas are furnished to the highest standard with antique style modern furniture, leather settees and many additonal features. 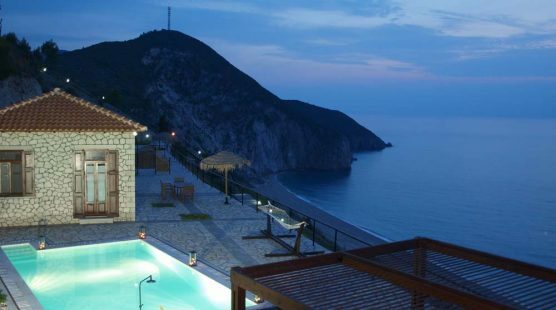 All the rooms are generous size and all look out over the sea. 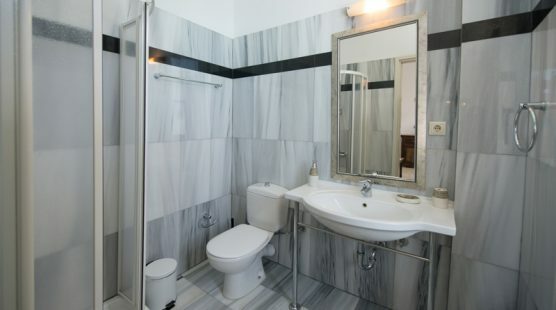 The bathrooms and shower rooms are marble floored and tiled with quality fittings. 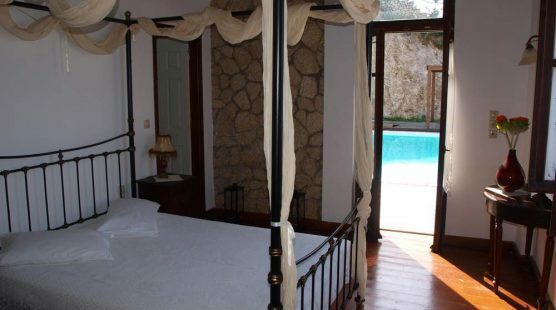 To the outside each villa has its own private pool or Jacuzzi with decking areas for sunbathing. 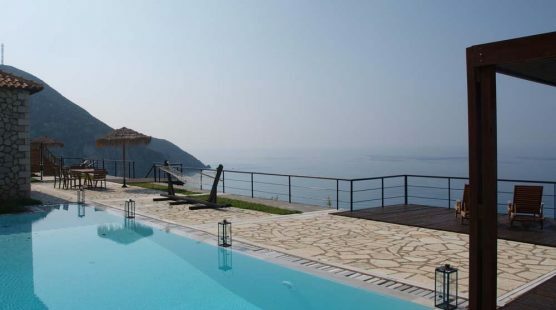 The pools are very close to the villas so that the children can be kept an eye on. 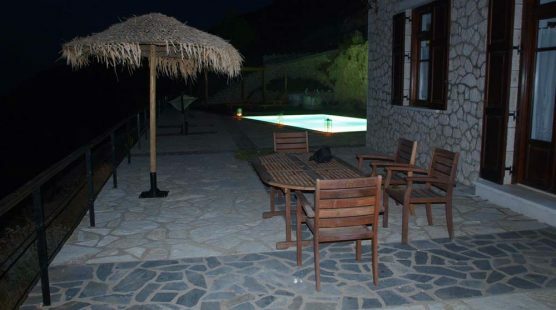 There are sunbeds, chairs, large table, 2 umbrellas beside each pool and a gas BBQ for those mild summer evenings. 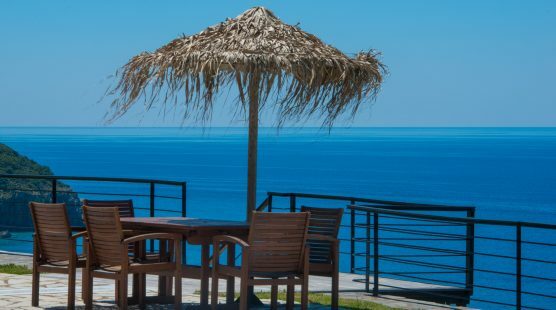 On an afternoon you can enjoy your meal on the large terrace in front of your villa and see the unforgettable sunsets, relaxing in the large outdoor space of your pool / Jacuzzi while enjoying panoramic views of the best beach in Greece! 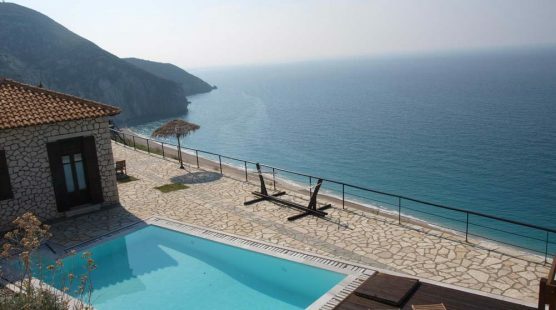 Stone steps with handrails lead directly from the villas down to the beach. 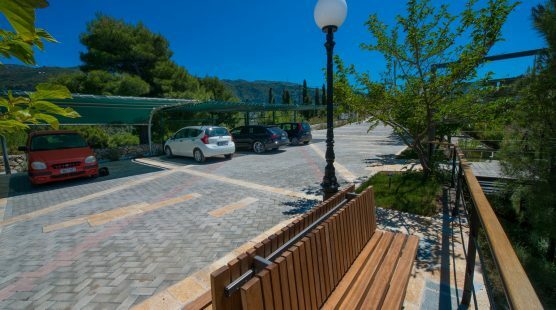 Groceries and tavernas can be found in the village of Agios Nikitas, a 2 minute drive away or just a ten minute walk.